Hoover Dam - one of the greatest engineering feats of the modern world, exchanging pleasantries with loved ones by the dancing fountains at the Bellagio, catch panoramic views of the spectacular Lake Mead from the viewpoint up the hill,or a scenic drive to Red Rock Canyon. When it comes to activities in Vegas you might think all there is to it is the casinos and a bunch of other adult x-rated stuff that happens and remains in Vegas. I was equally surprised during my recent visit. Keep reading for some lesser talked about, family friendly and kid friendly experiences in this desert city. Remember to bring lots of drinking water if visiting in the summer. Located about 35 miles from Las Vegas boulevard, Hoover Dam proved a viable alternative to the "big 3 vices" this casino-laden desert destination is more famous for. Even though the dam is a wonder in its own right, the scenic drive to the location is spectacular and out of this world. It blew my mind. Named one of the 7 wonders of the industrial world, Hoover Dam continues to wow millions of visitors every year. If you have the time and money, consider doing the dam and power plant tours to learn all about the dam's history and current operations. On your way to Hoover Dam, do stop by Lake Mead for some quite time or lunch at the Harbor Cafe. If looking to spend more time here, you can go fishing, swimming, or even camp by the recreation area. The view of lake's blue-green color against a backdrop of the red rocky mountains and clear blue sky offers some much needed serenity from the hustle and bustle of sin city. To access the lake, drive off of either route 166 or 167 east of Las Vegas. Welcome to Red Rock Canyon located just 17 miles west of the Las Vegas Strip on Charleston Boulevard aka State Route 159. With a total area of about 195,819 acres and more than 30 miles of hiking trails it is the ideal balm for any soul weary of the casinos of Vegas. You can also go on rock climbing, horse riding, and mountain or road biking escapades. Other enticements of Red Rock Canyon include the 13-mile scenic drive, picnic areas, nature observing points, and its unique sandstone monoliths in earth-toned colors contrasted by orange and green lichens, more than 45 species of mammals, about 100 species of birds, 30 reptiles and amphibians, and countless plant species. 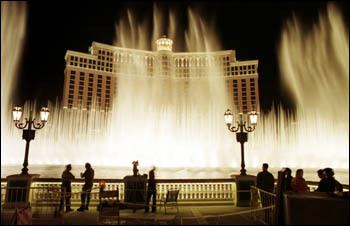 A combination of water, music, and light; choreographed to opera, classical and Broadway musicals against the backdrop of Las Vegas' skyline is one of the most refreshing alternative to the casinos of this great city. Located outside the Bellagio hotel-casino at the junction of Flamingo Road and the Vegas Strip, this 8.5 acre lake gyrates 1,214 jets with water up to 460 feet into the air. 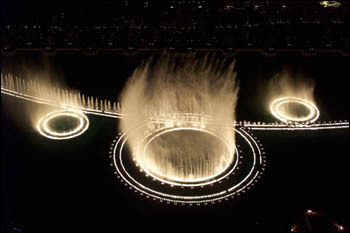 The fountain shows run every half hour from noon to 8 p.m. and then every 15 minutes from 8 p.m. to midnight. On Sundays, the show starts and ends earlier. Every 15 minutes from 11 a.m. to 3 p.m.
Vegas and Jesus... not two words that are often mentioned together in the same sentence. However, on one of the nights as I strolled through the Strip, I spotted a bunch of guys carrying placards and sharing the gospel of Jesus Christ with whoever would listen. So hey, all those trying to figure out if there's any activity in sin city fit for Christians, there you have it - preach on!!! One other thing that surprised me about Vegas is that the city looks like one city during the day, and a completely different one in the night when lights adorn its lavender skies. Quite a sight to behold. Other than the beauty of the lights, its also a pleasant pass time just enjoying the various entertainment options that line up the streets ranging from solo wannabe musicians, to people watching, and even magicians. An intersection of world cultures, live entertainment, global cuisine, costumed fans, endless entertainment, and non-stop action. Since its debut in 2010 and through to 2019, Las Vegas has been and continues to be host of the USA Sevens International Rugby Tournament at its Sam Boyd Stadium. The three - day event brings 16 of the top rugby sevens teams from around the world to a fan base of about 60,000 who attend the tournament annually. The 2016 tournament will take place between March 4th and 6th. However, before then fans will be treated to a week full of rugby festivities beginning February 29th. The teams expected to compete include: Argentina, Australia, Canada, England, Fiji, France, Kenya, New Zealand, Portugal, Samoa, Scotland, United States, Russia, South Africa and Wales. Visit USAsevens's site to purchase your early-bird ticket for the event.